The Green House at Eskhill is a modern eco-house that proudly sits in the kitchen garden of their former home, an 18th century Georgian property. The Burleys were seeking a large greenhouse for growing fruit and vegetables that would provide a suitable contrast with the garden’s formal Victorian layout. Robin and Lindsay were keen to maintain the character of their garden, which comprises four symmetrical quadrants in a pathways layout dating back to the 1830s, but, as they set out to meld the new and the old in the garden, they decided a traditional greenhouse would not fit as part of their vision. On a visit to the Isle of Skye while they were planning their new house, the Burleys came across a group of three Solardome® glasshouses which overlook the Sound of Sleat. 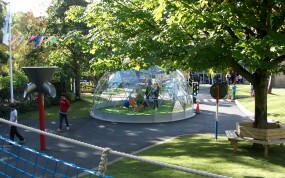 They realised then that a geodesic dome was exactly what they needed. The dome is the ideal design…and makes a stunning feature. Once they had explored the range of Solardome® glasshouses, they decided that the six-metre Retreat would fit the site best. For the Burleys, a yin-yang theme – the idea of the old and the new working in harmony – was at the heart of their project, which left Solardome’s modern geodesic structure as the clear choice. “For us the dome is the ideal design. 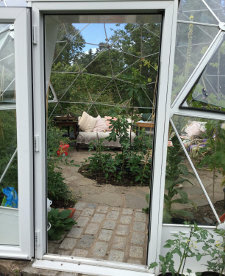 Visitors are instantly greeted by the Solardome® glasshouse, which makes a stunning feature, and is the first of many exciting surprises that the house and garden holds for them,” Robin said. This stunning garden was featured in The Garden by The RHS and Scottish Field magazines earlier this year. Check out our Solardome in the news page to see more of our press coverage. The challenge To provide a spacious modern glasshouse for growing fruit and vegetables with space for a seating area. Solardome supports BBC Children in Need by donating a SOLARDOME® Retreat to The Yard, a centre for children with learning and physical difficulties.